So we’ve flown into Week 2 and what a week it’s been. (Not that I would have expected anything less on a show with about a million different elements to it like this one). Come Monday morning we all excitedly reconvened to appreciate lovely Matthew’s (Officer 2) sassy new haircut and to welcome Rosie (Assistant Stage Manager) and Patricia (Company Stage Manager) to the room following their fabulous run of ‘The House or Bernarda Alba’. Let the fun commence! It was exciting times as we began the week with a few group exercises with some researching the historical events of the 1950’s, some doing in depth character work and our team cultivating a timeline of the show spanning from 1939-2017. 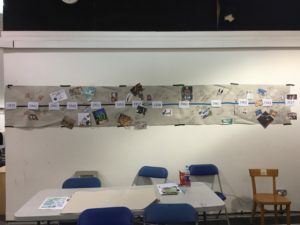 I don’t think that Kerry (Director) envisaged just how obsessed we would become with our little project and come 5 days, 2 HP printer cartridges, a bucket load of Google images and a few cheeky cast head shots later – we had a pretty epic TIMELINE! Once our project session was over it was time to start at the beginning (sans Overture – we’ll do that bad boy later) and put Act 1 on its feet. This involved us firstly revisiting some cheeky harmonies from Week 1 where Rob (Musical Director) asked Stacey (Mrs Simpson) whether she would mind taking the lower line, to which she eloquently replied “I’ve been happy to be bottom since 1985”…couldn’t have put it better myself! This was followed by us blocking the show from the top and that is where the company realised just how busy we are all going to be. Kerry was not wrong; there is a job for everyone, everywhere! I must give particular credit to Julian & Matthew (Officers 1 & 2) for their beautiful masterclass in ‘Military Marching’ and Alim & Donna (The Lover & Mrs Walker) for their ‘Mills & Boon’ moment in the first scene – steamy stuff! Wednesday was always going to be an exciting day with the first session of costume fittings taking place in a warehouse in Hendon. No spoilers but there are some pretty funky outfits in the offing and some pretty snazzy footwear entering the rehearsal room. I was already particularly exhilarated after watching Hearns’s (dancer extraordinaire) raunchy BSL interpretation of ‘Red Lorry, Yellow Lorry’ during the vocal warm up, and then came our Fight Director, Bret Yount, who bowled up to choreograph a couple of physical moments in the show. I can tell you, it looks blooming great! We were also joined on Wed by our new rehearsal pianist Dan de Cruz (known as DC to most) so that Rob doesn’t need to be win a zillion places at once. And that guy sight read his way through Act 1 like a gem – thank you DC! On Thursday our gorgeous choreographer Mark put our dancers through their paces as he worked through ‘Cousin Kevin’ and I have to say that those guys are looking incredible already. Lukus (Cousin Kevin) seems to have that ‘school bully’ thing nailed, unbelievable considering how angelic he is in real life…! Following this, our fantabulous Alim was appointed as our Company Dance Captain. I personally can’t believe that, with my uber talented two left feet, they didn’t pick me but whatever…great choice…that boy will make everything sparkle! Meanwhile, sweet and lovely Rosie (ASM) was left to Google risqué sites on the interweb. “Prop shopping” she says….sure Rosie! We were also joined in the room today by our delightful band with Tony (guitar), Steve (bass guitar) and Adam (work experience……..just kidding, he’s on drums!) so that we could feel a bit more of the vibe close up. You guys sound AWESOME! Then we had Friday, which began in the best way possible with a mystery benefactor supplying us with a table full of cake, sweets and biscuits. Whoever you are, you can come again, you are welcome anytime and, if you’re reading this, I am particularly partial to a milk chocolate HobNob…or a KFC! We were again joined by a newbie, Pete from the New Wolsey, who came to document rehearsals for some video footage, and managed to catch me falling flat on my face as a result of me falling over my own feet. Seriously…why aren’t I Dance Captain?! We then embarked on a run of Act 1. It was busy, sweaty and pretty darn brilliant considering that were only in Week 2 – FYI, this is going to be amazing! 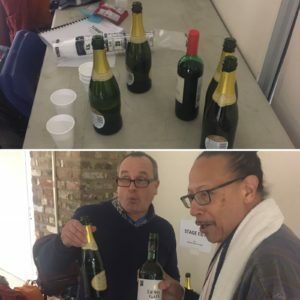 Friday was topped off by a beautiful gesture from Peter (Acid Queen) who supplied us with ‘End of Week 2 Goodies’ with plenty of bubbles and a wonderful night was had by all! In other news, sensational cast member Shekinah recorded a music video to her single ‘Beautiful to You’ – EP to be released at the end of year so look out for that. Handsome but clumsy Julian managed to break the French Horn for the second time in 2 days… a dramatic method to get out of practicing methinks! Oh, and Alim… its Pinball Wizard, NOT Pimple Wizard….hehehe! 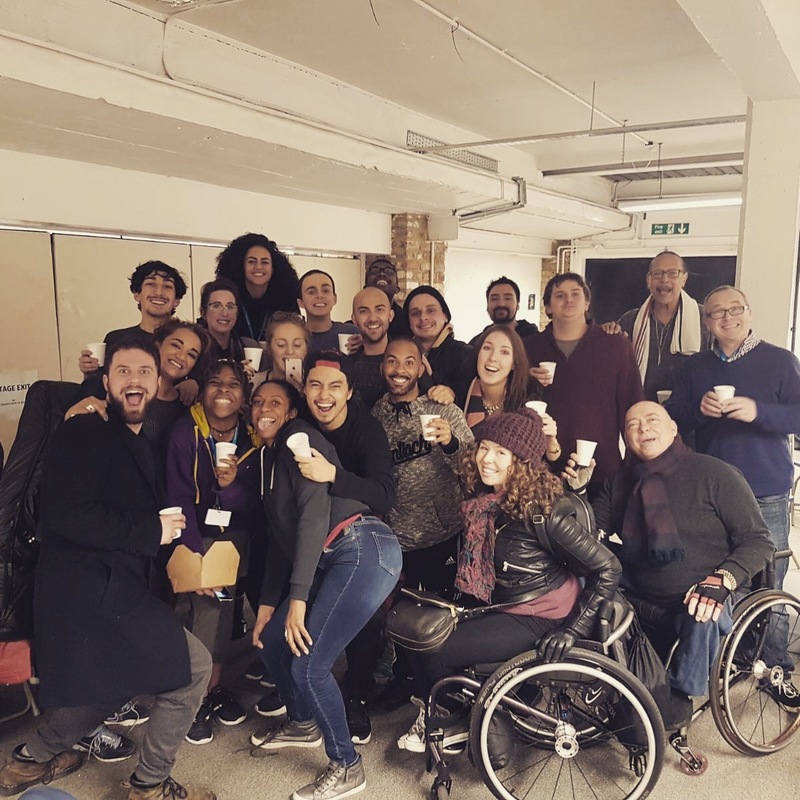 The cast of Tommy at the end of Week Two. Image by cast blogger Natasha Lewis.